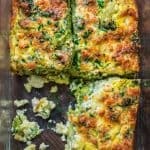 This Breakfast Broccoli Bake made with eggs, Provolone, and feta cheese is healthy, filling and delicious way to start your day! That’s the only Broccoli Bake recipe you’ll ever need. In a medium bowl, whisk the eggs with Provolone, milk, parsley, salt, and pepper. Set aside. Place broccoli in a 9 x 6 inch casserole dish and sprinkle feta cheese on top. Pour the egg mixture over the broccoli. Using a fork, even out the broccoli florets, making sure that egg-cheese mixture is spread out evenly. Bake for 30-35 minutes, until golden brown.